What would your life be like with straighter teeth? You’re probably imagining the positives of a confident smile: the freedom to laugh and smile with abandon, never wondering if anyone is noticing your crooked teeth. Well, your dentist in 63141 knows the advantages of straighter teeth go beyond the cosmetic — that’s why Feigenbaum Dental is so happy to offer Invisalign, a clear braces system to patients interested in subtle orthodontic treatment. We’ve listed the top four unexpected benefits of a well-aligned smile here. Can you think of any we haven’t included here? Let us know in the comments section below! Teeth that are crammed together in the gum line are difficult to brush, and sometimes impossible to floss without causing bleeding gums or, at the very least, major discomfort to your fingers. Unfortunately, those untouched areas allow for major plaque and tartar buildup, meaning cavities and gum disease aren’t far behind. When your teeth are side-by-side like they should be, you can thoroughly clean the surface of each and every tooth for better dental health overall. When your top and bottom teeth don’t fit together like they should (like in cases of crossbite, underbite and overbite) your jaw has to work overtime to reposition itself with every single bite. That undue stress can lead to the painful condition with the temporomandibular joint known as TMD. Side effects of TMD include chronic headaches, facial and ear pain as well as difficulty using the jaw normally. When teeth are crowded, one or two may jut out and bump against the top teeth multiple times throughout your day. All that unnecessary force leads to premature wear on the teeth, which may result in breakage, problems chewing and speaking as well as other serious dental issues later on. These misaligned teeth are also more likely to be bumped and broken or injured in the event of an accident. When you can keep your teeth and gums cleaner, you’re reducing your risk for gum disease and a whole host of related health issues. Did you know that heart disease, high blood pressure and diabetes have all been linked to gum disease? It’s true — straightening your teeth can help you enjoy better overall health for years to come. Now that you know a little more about the benefits of a well-aligned smile, why don’t you take some time to find out about Invisalign in St. Louis? 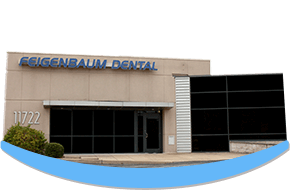 Feigenbaum Dental is happy to offer patients the clear braces option. Read more about Invisalign here, then request your consultation online today!